Thus, the focus of marketers should be raising the engagement level through high quality personalization. Artificial Intelligence and Analytics can help bridge the gap between data and insights which can fundamentally change what and how marketers interact with their consumers. 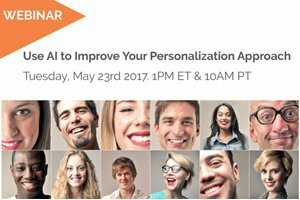 In this webinar, Dr. Anil Kaul, CEO and Co-founder at Absolutdata, and Rajat Narang, Associate Director at Absolutdata sets the foundation for moving to an Artificial Intelligence based hyper-personalized marketing approach by highlighting a real-world example of Hospitality leader experiencing 12% incremental revenue through hyper-personalization. Integrating AI into existing marketing systems by overcoming possible pitfalls. View the webinar recording to learn how AI can enable personalized outreach at scale and help you get up, close and personal with the customers.